Well…I was actually building Star Wars props (weapons, gadgets, etc.) for quite some time. When looking for reference pics, I came across …the 501st. The second I seen the armor….my jaw dropped and I was in love. So I started doing more and more research. At the time, in Disney’s MGM Studios Star Wars Weekends was coming up and I decided to check it out. And that was IT! I HAD to join. I began talking to Eric (a GREAT prop maker I might add) and really helped me with a lot of great ideas and parts. Then I got in touch with another Eric at TrikToys (GREAT guy and helped me a TON!). So was the start of my Armor adventures. Then just by chance, I got a hold of the CO of the Florida Garrison at that time. A great friend and someone I’ll never forget..Dean TK-899 (I miss ya brotha!). I can write a whole paragraph on this guy…so to keep it short. One of the most upstanding troopers in the 501st. Dean along with Bones TD-8107 and Scott were the reason why I fell in love with the 501st. It was all heaven from this point on. Thanks guys! I owe ya! TK (Stormtrooper) was my first set of armor I built. I still have it to this day. I couldn’t wait to go on my first event. Little did I know it would change my life forever. I met the guys in the local Everglades Squad and they told me, the next event was Joe DiMaggio’s Children’s Hospital. “Umm…a hospital? ?” It wasn’t for a couple weeks so I started to think “what can we do?” Well, we got a TON of support to say the least. Tate’s Comics donated a TON of Star Wars toys and comics to us for the children at the hospital (Tate’s RUES!!). We got a hold of 2 DVD players and even EP 1,2,4,5,6 DVDs. I must have went to 5-6 Toy’s R Us to get every Star Wars sticker I could find as well. When the event came up, I’m glad I was behind a helmet. I truly wanted to cry. Somehow material items weren’t going to make these children’s lives any better. Well, little did I know. When the kids seen us, they forgot about any illness, injury, or sickness they have been struggling with. Now I wanted to cry for a totally different reason. We brought them happiness…joy…excitement!! They would never forget us…ever! But one child changed my life and my views on the 501st forever. As we were walking down the hall, the liaison cracked the door…and said “We’ll pass this room..I don’t want to disturb her..” So we did. Two rooms down….The Mother of the child ran to us…and told the liaison ..”wait!! ..my daughter wants to see you all!! Please!” She said “ok”. Out of the room comes the Father holding her Daughter’s hand…she bald…she’s hooked up to all kind of tubes …and…she’s crying. My first though was …”OMG…Vader is scaring the hell out of her!” I later found out, she heard we were here and she “demanded!” to come see us. She was crying because she just came out of Chemotherapy (one of many doses) and it was painful for her to walk. She walked up to us…and her smile changed me forever. We told her parents TAKE PICTURES!! So we put on a great show for her. Now she has some of the best pictures ever. She would never forget us. At that moment….the 501st took on a new meaning for me. As a group…as individuals….as human beings…we have a greater purpose. The costumes are great and the events are fun, but to change a life and to make a child forget “the bad” ….. that is what this is about. A side note, the liaison contacted us two days later. She told us the kids LOVED us and they loved the gifts too! But we were told…”please, no more stickers tho! The kids put them on the beds, on the machines, on the doors, the walls….” …. I guess we really did make an impact. So now I was hooked forever! I was elected Squad Leader of Everglades Squad and held the position for almost tree years. With the help of Marcus, Michael, Chase, Bamatrooper and Vi’per, we forged Clonetroopers.net in 2005. I became the XO of CT.net as well as the Armor Chief. I continued my prop building and making suit after suit after suit being I was addicted at this point. With the help of Andy (EVO3 – my XO of ES at the time and great friend! ), my props got better and better and my armor collection grew and grew. With my love for the 501st, I’ve driven all over the state of Florida and attended in hundreds of events up to the present day. 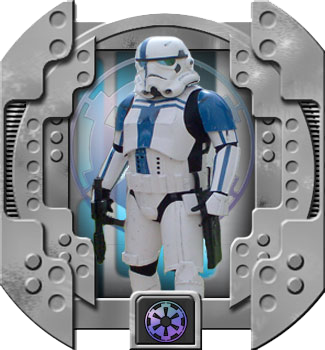 And now, Everglades Squad has evolved into one of the most active in the Florida Garrison with a great 501st family. This is an amazing group and garrison that I’m so proud to be a part of. Since 2004, I’ve had the pleasure of trooping and becoming friends with members from all over the US and overseas. I don’t think I’ve met a bad trooper yet! The 501st is truly a “family”. And now that my Wife is a member, she also became the Captain of South Florida to our sister club – The Rebel Legion. Now, the whole family is involved! My Daughter is Leia at our events, my youngest Son is a Jawa (says he’s a “baby Jawa”) and my oldest Son I’m currently working on a Darth Malgus for him. Not only does it give the family a great time out together, but it also teaches great values to our kids. So join the Darkside!! Come to The 501st and join our ranks!